This new house maximises the hilltop position and stunning views of the surrounding countryside by placing the living accommodation on the first floor. A glass wall with sliding openings provides a balcony arrangement and provides a panoramic picture window to the fields beyond. 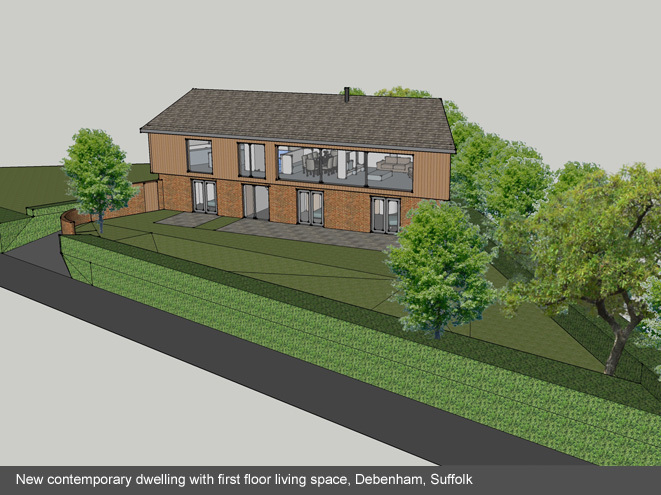 The first floor plan over-sails the ground floor to make the best use of the available site area. The house will be highly insulated in order to limit energy use and will use recycled materials from the existing buildings, which are to be demolished.